Wilkyns M. Chal Batista, 1 of 6 children, grew up in Batey Central, a village within Barahona, Dominican Republic. His dad left the family when Wilkyns was very young. It was an on-going hardship on Wilkyns' mother to make enough money to provide for her loved ones. Throughout his childhood Wilkyns remembers well of the lack of food, and that haunting feeling of being hungry. At age 14, Wilkyns embraced Jesus to be his Lord and Savior and has dedicated his life to following his Lord Jesus Christ since then. 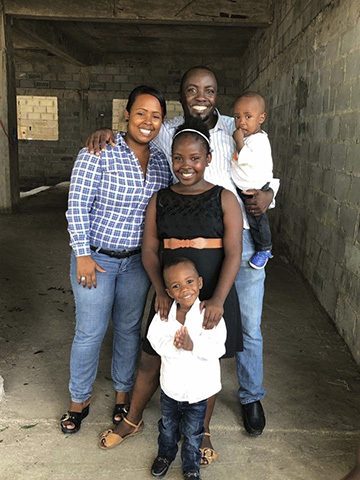 Presently, Wilkyns, his wife Melissa, daughter Wilmely, and two sons Wilkyns Emmanuel and Wilkyns Josias continue to live in Barahona, ministering to the people who grew up in very similar circumstances. God put it on Wilkyns heart to start a school for children. In 2011 Wilkyns founded Centro Educativo Niños Llenos Del Amor De Cristo. Most of the children who attend the school do not have enough food or a basic education. Wilkyns strategy is to teach basic academics, English, and the Scriptures. Each day, approximately 175 children are taught from a Christian worldview in which Jesus is lifted up as Savior and Master who cares about their lives and wants to lead them in “His way”.